Stephanie graciously hosted her 9th Tea Cup and Mug Exchange and I was so, so happy to participate once again. 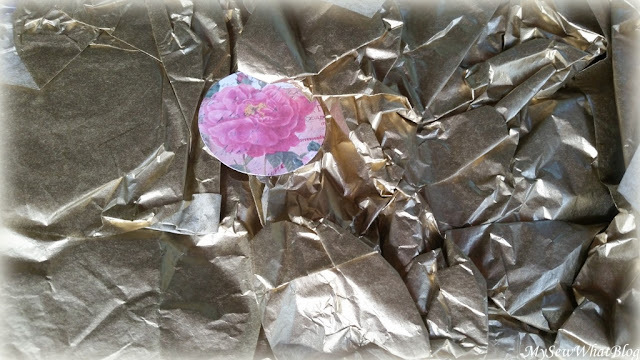 Today is the reveal day..... and I am excited to reveal the contents of the very lovely package I received from Debbie Harris who blogs at She Graces Her Home in God's Beauty. 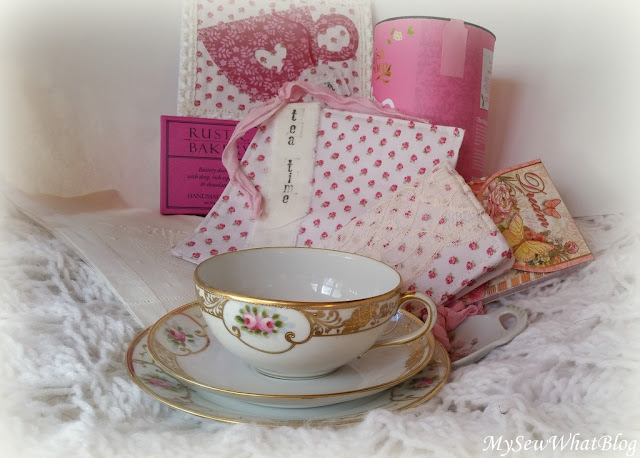 In case you are not aware, she is also mom to our tea cup swap hostess! 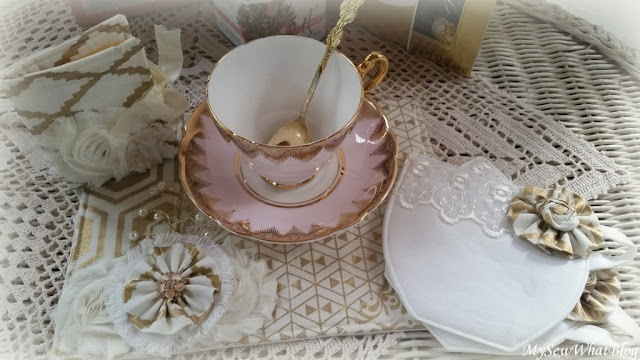 My package arrived and much to my surprise and delight, I recognized the return address as belonging to someone I had sent a tea cup to some time ago! I took my package out to the back porch, sat on my wicker love seat and proceeded to open it, fully planning to enjoy opening every little treasure! Pink and gold was the theme! Just look how pretty everything is! 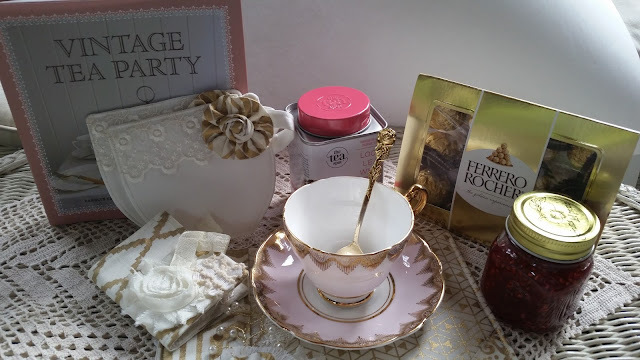 It was the loveliest collection of pink and gold! 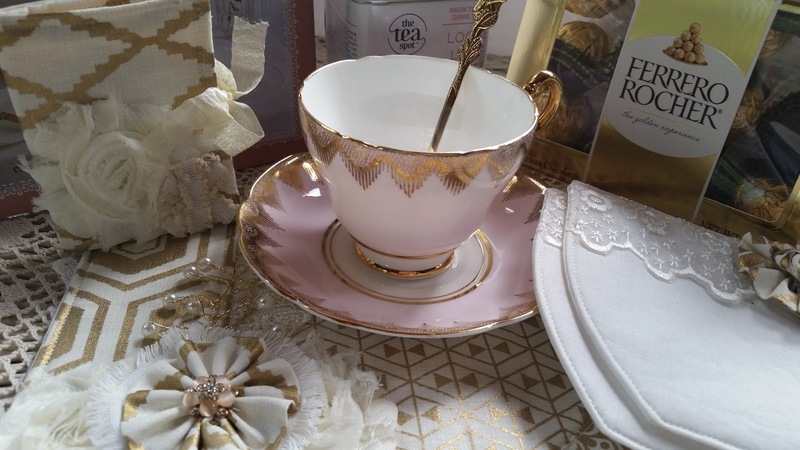 Feast your eyes on this pretty teacup! It is exquisite! ......and the little gold spoon! It has a sweet little rose on the end of the handle. I fell in love with it! 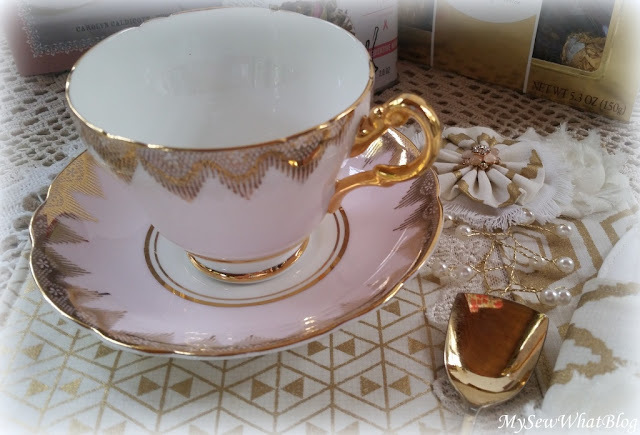 I had been in my favorite antique shop earlier in the week looking for a gold spoon as I realized so many of my tea cups are edged in gold. Debbie may not know it yet, but she has started me on my latest collection: my gold spoon collection! 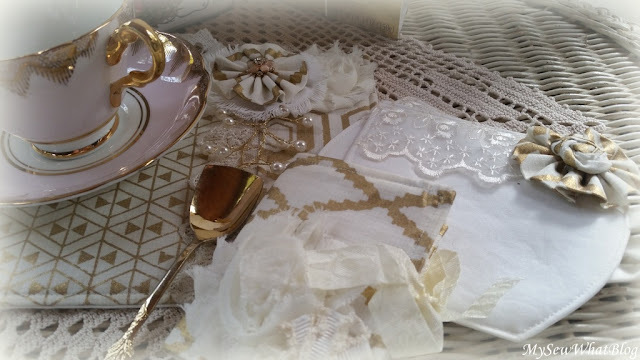 You may have noticed the beautiful gold and ivory accessories. They are beautiful and make such a perfect table setting. 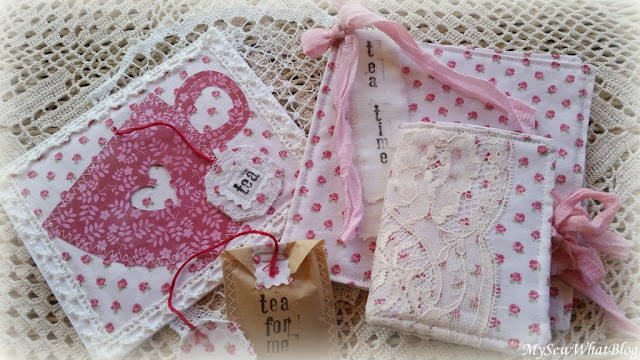 Debbie purchased these from Stephanie's Etsy shop and they are just stunning! If you haven't stopped by her shop, here is the link! So much prettiness! In this photo, note the fabric flower on the left side of the mug mat. It's a bit difficult to make out here but there are pink stones set in gold. It matches so perfectly! It's a little easier to see here! I just kept looking at it over and over again! Here are more treasures!....some delicious white loose leaf tea (YUM! 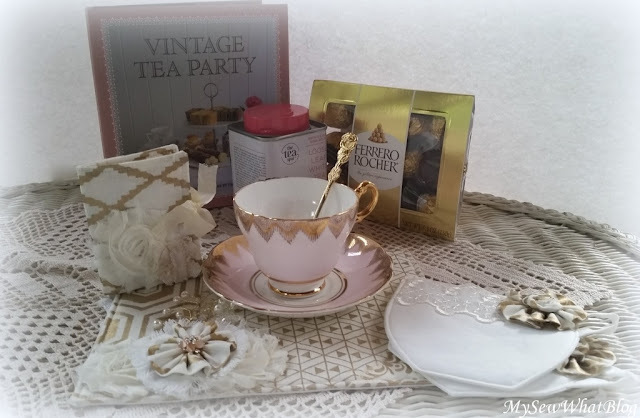 ), chocolates (which my husband and I devoured) and a book, "Vintage Tea Party." I have been enjoying this book in the evenings after dinner. It sits on my end table in the living room and I read and reread the interesting facts and history of making tea, the proper way to make tea (I've been doing it all wrong for years!) and so many delicious recipes. Last but certainly not least, Debbie included a jar of her homemade Raspberry Preserves. I had it on my toast every morning until it was all used up. It was delicious! I cannot believe that I have never tried my hand at making jam.....Debbie has inspired me to give it a try! I think I will start with raspberry jam as it is one of my favorites! I was so touched by the generosity of Debbie's gift and the thoughtfulness that went in to putting this perfectly pink and gold package together for me! It happened to arrive on a day that I was feeling a bit weary and overwhelmed, so to say that it lifted my spirits immensely is an understatement! Thank you Debbie for these lovely gifts and the sweetest gift of all--your friendship! You are such an inspiration to me! Now, I'd like to introduce you to Martha who blogs at Martha's Favorites. 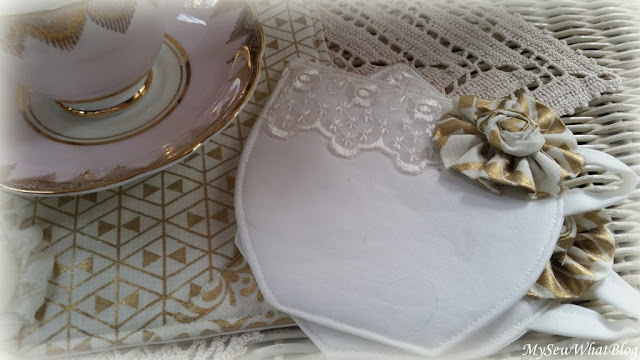 I was given her name in the swap and enjoyed shopping and sewing for her! and sent her the tea cup that you see pictured above. You can read all about it here! 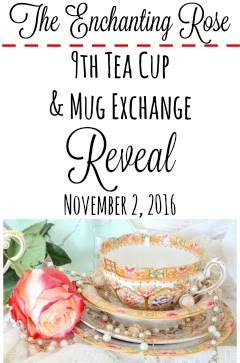 So another tea cup exchange has come to a close....I'm already looking forward to the next. As always I am very thankful to Stephanie for putting this swap together for all of us to enjoy. As my collection of tea cups grows I am reminded that my collection of friends is growing at the same pace. That, my friends, is a blessing!